Figo was founded in 2013 in Chicago, IL, as a startup in Google's Tech Hub Network 1871. The founders combined their love for pets, obsession with technology, and background in insurance to build a platform that is entirely focused on making life easier for people and their pets. They are the only company to provide a “Pet Cloud” as part of their service. This functionality allows pet owners to upload medical histories, and pet profiles for each of their pets. This information can be critical in instances where life-saving medical treatment is needed away from your home veterinarian. It is easily accessed from any computer or mobile device. They are also the only provider to wave deductibles and co-pays for emergency, life-saving procedures. Figo has fully embraced utilizing technology in their day to day operations. In addition to their “Pet Cloud” they also offer a mobile app, next generation pet tags (see more on this below), online pet profiles and record management, as well as customer support via text, chat, twitter and other platforms. Figo is an excellent choice for those pet owners who love using technology and are looking for affordable comprehensive coverage with top-notch customer service. 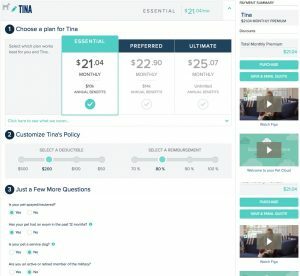 Figo offers three different plans, with their Essential Plan providing for a $10K annual limit, their Preferred Plan offering a $14K annual limit and finally their Ultimate Plan, which is an unlimited annual limit plan. Each plan offers different deductibles ranging from $50 to $500, and four different reimbursement levels – 70%, 80%, 90% and 100%. Figo also offers a 30 day Money Back Guarantee, so you can sign up and as long as you don't file a claim you can get your money back if you aren't happy with what you see. 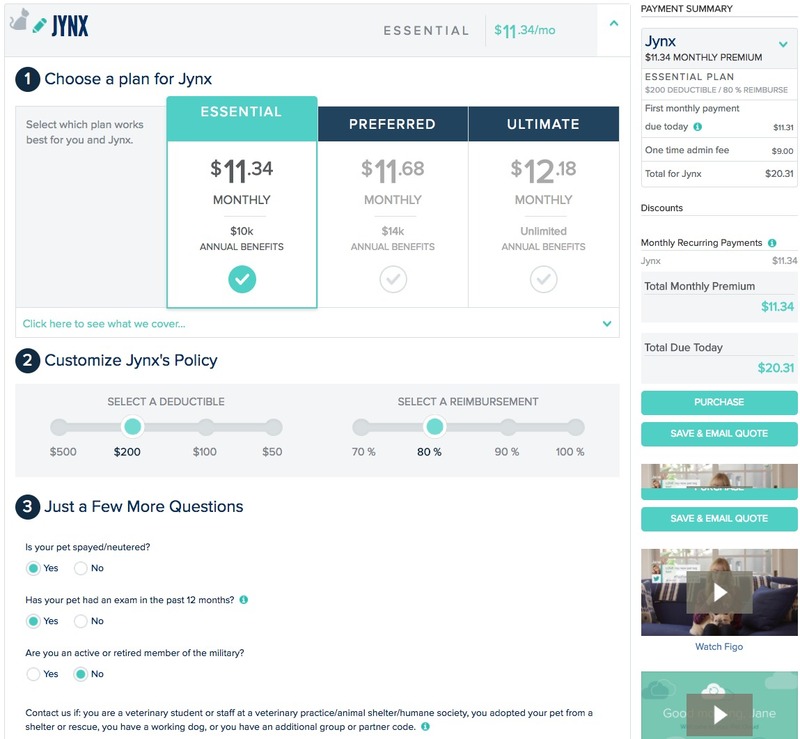 You can not beat Figo on plan configuration flexibility – allowing customers to pick the exact right coverage they feel they need for their particular pet, while providing very generous annual limits even on their lowest level of $10K and including an unlimited limit as well. They are one of only a few pet insurance providers to give the option of 100% reimbursement for those looking for this option, while also offer a low $50 annual deductible. Overall we found the pricing on the sample quotes we did to be right in line with their competitors and very affordable. They offer multiple ways to save on your plan with discounts for active duty or veteran military members, medical service dog discounts, Veterinary Clinic Staff and Students Discount, multiple pet discounts, a discount for paying your premium annually, and more! Below is our sample quote for a 2 year medium mixed breed dog from Minnesota. You can see the flexibility you are given in pricing a plan specific to your needs. Below is our sample quote for a 2 year old domestic short-haired cat from Minnesota. Figo's waiting periods are 14 days for illness and 5 days for accidents. However both of these can be waived if you use a partner Veterinary, Shelter or Humane Society code when purchasing the policy, and your pet receives a wellness exam within 48 hours prior to purchase. There is also a 6-month waiting period for problems associated with cruciates and patellas (knees). However, if you choose to have your pet examined by a veterinarian within the first 30 days of the policy, and the medical record specifically notes that your pet does not have any pre-existing conditions relating to its knees, the 6-month exclusion will be wiaved. They also mention that they will review pre-existing conditions on a case by case basis, and may waive a pre-existing condition if they deem the condition was curable and it has not shown signs or symptoms in the prior 12 months. Figo is available in all 50 states, Canada and Puerto Rico. Figo does have quite a few exclusions. However most of the exclusion listed by Figo are also exclusions for most other pet insurance providers, other than preventative care, Supplements, and Obedience – however with most other providers these all would be add-ons for the most part anyway. Pre-existing Conditions (see our note under waiting periods) Breeding, Pregnancy, or Giving Birth – however, they may provide coverage due to complications that arise after the waiting period. Figo offers four deductibles of $50, $100, $200, and $500. They offer four reimbursement levels as well – 70%, 80%, 80% and 100%. They are one of only a few that offer a 100% reimbursement rate. There is no wellness exam required before enrollment. Claims can be submitted online, over the phone, via fax or email, or by mail. All claims will be processed within 30 day but their goal is between 7 and 10 days. All reimbursements are made by check or ACH via the Pet Cloud to you, not your veterinarian. Figo offers very generous payout(annual) limits of $10,000, $14,000 and also an unlimited payout option for those who expect large veterinarian bills. Even on the low end of $10k, these payout limits are generous and will fit most pet owners needs. This is an area of good news, bad news for Figo. 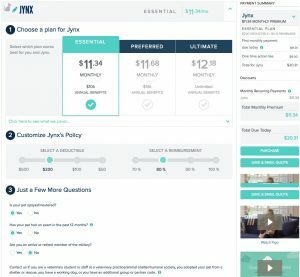 While they do not offer much in the way of additional add-on options such as Dental, Wellness, Pregnancy and Obedience they do offer included extras (no extra cost) that other providers do not offer. We felt that the technological benefits outweighed the lack of benefit addon policies available. For tech-savvy pet owners Figo's Pet Cloud has tons of features that will truly delight you and take the “hassle” out of dealing with insurance! The extras you get with Figo include their Pet Cloud where you can store just about everything there is to know about your pet, along with his/her medical records, address if lost, etc. It is also where you submit all claims, check claim status, and see payments issued. You get an email address specific to your pet cloud, which you can then send anything you want to keep in your Pet Cloud account to – even have your veterinarian send bills, reminders, shot records, etc. to this email address and you can then store all that information in one easy place. Figo also offers an enhanced pet ID tag to all covered pets. This ID tag has a unique id # imprinted on the tag along with instructions to go to FIGO's website if you find a lost pet. All the person who has found your lost pet has to do is enter the Id number, and send a text to the owner write from the website. 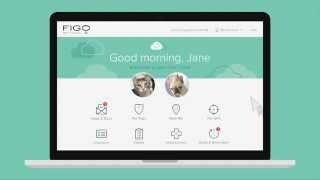 Watch the video below to get more information about all the features the Pet Cloud from Figo has to offer. We were very impressed with the level of technology and features that are available with every policy. Enrollment with Figo is extremely easy and can be done online or over the phone. All that is required online is to enter basic information about your pet(s), get a quote, and then enter billing and payment information. There is a onetime processing fee of $9. Figo's goal is to make insuring your pet as easy and hassle free as possible. Figo can be reached via phone at 844-493-4130 or by text, email or live chat(for enrolled customers only). Pricing depends on breed, age, size, and the deductible, annual limit, and reimbursement level you choose – as well as any discounts you qualify for. *Sample costs based on a 2 year old medium mixed breed dog or domestic short-hair cat from Minnesota with a $200 per annual deductible, 80% reimbursement level, and $10,000 annual limit. You can select from Monthly or Annual contracts. If you select the Annual option you will get a 5% discount on top of any other discounts you qualify for. Figo insures cats and dogs from 6 weeks on up. They have no maximum enrollment age – however the older your pet, the higher the premiums may be and the more pre-existing conditions that may be excluded. Figo does not offer wellness coverage. They feel that pet owners are better off financially if they invest in an inclusive accident and illness policy while managing their pet’s proactive healthcare out of pocket. Figo's comprehensive plans cover both Illness and Accidents. Deductibles available are $50, $100, $200 or $500. Figo will not increase premiums based on filing claims. Annual limits of $10,000 or $14,000 are available, as well as an unlimited annual option. Figo will cover things such as prescriptions, veterinary specialists, congenital and hereditary conditions, holistic and alternative therapies, Prosthetics & Orthopedics, Cancer treatments, and Hip Dysplasia. We feel that Figo is an excellent choice for any dog or cat owner that is looking for comprehensive illness and accident coverage, while paying for wellness and routine visits out of pocket. Tech savvy pet parents will be particularly happy with Figo. If you watched the video above (and if you haven't, you really should), you will see why we can't say enough about this feature. If you've ever had an emergency vet visit and had to deal with a veterinarian who is not your normal vet, you know how important it can be for the emergency vet to have easy access to your cat or dog's full medical history. It can literally be life-saving for your pet. On top of that, Figo's pet cloud allows you to keep a record of vet bills, claims, immunizations and more all in one place, as well as easily file and track your claims. Figo's lower annual limit of $10,000 is far better than most other pet insurance providers who may start at an annual limit of $2,000 or $5,000. Combine Figo's generous low end limit with the optional unlimited annual plan and you have coverage available for most any pet owner. Figo offers the option of a 100% reimbursement plan. This means that 100% of your actual veterinary bills will be reimbursed – no copay! They are the only provider in our list of pet insurers to offer this! Figo's love of animals comes shining through here – they wave all co-pays and deductibles in the instances where life-saving measures are needed. So for example your dog is hit by a car and he needs emergency surgery to save his life – you will not be worried about having to meet a deductible or deal with a potentially expensive co-pay, because Figo will wave both! Again no other pet insurer does this! Kudo's Figo! Figo does not have any upper age restrictions for new customers. May insurers will put an upper limit on which cats and dogs they are willing to insure. Owners of older pets (such as myself) will find this especially appealing. Figo provides id tags that easily allow people who find a lost pet with the tag to easily locate and notify the owner of the of that pet. Regardless if you pay monthly or annually you are charged this fee. No where do they state this until you get to the check-out page. However in all fairness, we see this fee on most pet insurance check-out pages, and suspect it is some how associated with reducing their underwriting costs. We understand Figo's reasoning on not offering wellness coverage, however being the parent of an older pet with dental disease issues that require frequent, expensive cleanings and extractions, we feel that offering an optional add-on for those pet owners who feel that the cost of such an add-on is worth it to them, would be a great option. This isn't just a “ding” on Figo, as most pet insurers don't cover Spay and Neuter, however with the increasing over-population stress put on shelters and pounds due to people not spaying and neutering their pets, we'd love to see all pet insurers cover this! It would go a long way to stopping unnecessary litters of cats and dogs that wind up in shelters across America. All in all we find Figo to be the best option for comprehensive accident and illness coverage for those dog and cat owners who are able and willing to pay for routine wellness exams out of pocket. We also love Figo for their willingness to wave deductibles and co-pays in cases of life saving procedures. Tech savvy pet owners will love Figo's Pet Cloud and find it to be an exceptional tool for maintaining their pets medical records, vet bills, and claims processing. 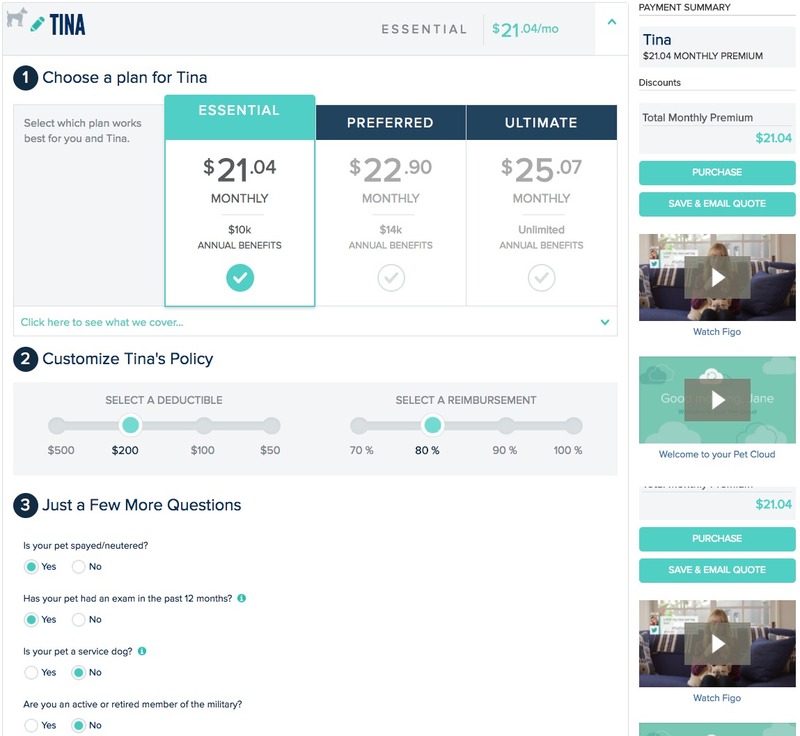 Excellent coverage options with deductibles and co-pays waived for life saving measures. Figo is an excellent choice for any dog or cat owner that is looking for comprehensive illness and accident coverage, while paying for wellness and routine visits out of pocket. Tech savvy pet parents will be particularly happy with Figo's Pet Cloud. Pricing depends on zip code, breed, age, size, and the deductible, annual limit, and reimbursement level you choose. Prices for Dogs will average in the range of $19.13 - $22.79 for small dogs, $21.04 - $25.07 for medium dogs, and $22.95 - $27.35 for large dogs. Prices for Cats will average from $11.34 - $12.18. $21.04 Get Your Free Quote!